Shangri-La Hangzhou has one of the best hotel locations in Hangzho, being right beside West Lake 西湖 and attractions such as Temple & Tomb of Yue Fei 岳王庙. Everyone comes to Hangzhou just for the experience of cruising around West Lake 西湖 and checking out the 10 best-known scenic spots on the West Lake, each remembered by a four-character epithet. Collectively, they are known as the “Ten Scenes of Xī Hú” (10 Scenic Spots in West Lake 西湖十景). Shangri-La Hangzhou was the first Shangri-La hotel that operated in China – you will notice that there is a East Wing and West Wing at Shangri-La Hangzhou – that’s because these 2 wings were previously 2 different hotels (not Shangri-La) before being bought over by Shangri-La Hotels. You will notice that the architecture style is quite traditional as the facade of the hotel is preserved as part of heritage conservation efforts. The interior of the Shangri-La Hangzhou was refurbished in 2006 and as you will see in the pictures below, the hotel actually looks quite modern. Shangri-La Hangzhou has 382 beautifully appointed guestrooms and suites located in two wings, the East Wing and the West Wing, and three villas in a separate annex. 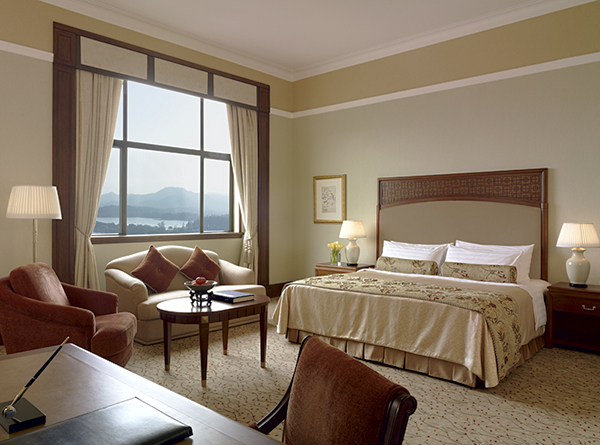 If you are staying at Shangri-La Hangzhou, do book a Lakeview room (these rooms are at the East Wing and understandably will be more expensive than the Gardenview rooms) as these rooms offer magnificent views of West Lake. Each of these Lakeview room offers 37 sqm / 398 sqf of luxury (complete with indulgent cotton bedding and spacious bathroom with plush bathrobes). 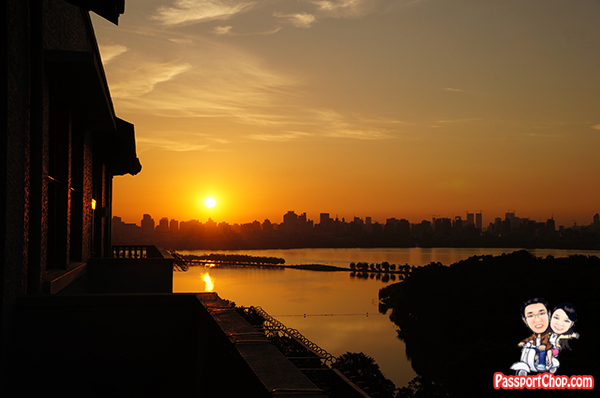 This is sunrise over the West Lake – a view we caught from our Shangri-La Hangzhou Lakeview room balcony! And we also caught great views for sunset too! Also, from our room balcony, we were able to view a few of the famous West Lake 10 Scenic Spots e.g. Remnant Snow on the Bridge in Winter (斷橋殘雪) and Moon over the Peaceful Lake in Autumn (平湖秋月)! 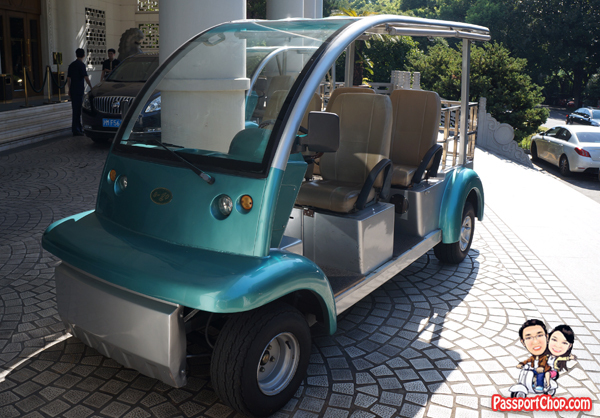 To get from the East Wing to the West Wing for breakfast at Coffee Garden or just to check out the Impression West Lake 印象西湖 performance or visit the Temple & Tomb of Yue Fei 岳王庙, you can catch a buggy (short 1-minute ride) but during peak periods, it might be challenging to get a buggy – check with the reception/concierge staff for help in hailing one! 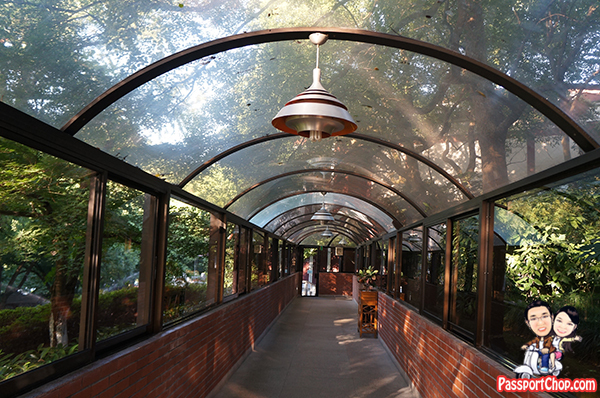 Alternatively, you can stroll along a sheltered walkway which connects the East and West Wing of Shangri-La Hangzhou together – the walk will take about 7 minutes but it can get quite hot during summer afternoons (the walkway is not air-conditioned). Characterized by elegance and stylish décor, Shang Palace offers a quality dining experience supported by a talented culinary team and a tantalizing selection of gourmet. 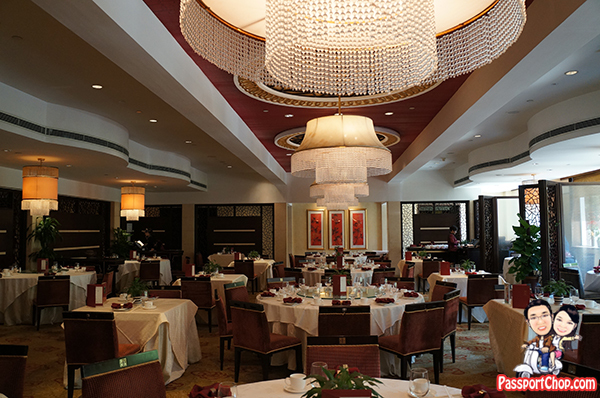 Shang Palace primarily serves essential and selected Cantonese and Hangzhou dishes as well as local specialties. The team of talented chefs create aesthetically beautiful and authentic dishes using the finest ingredients and techniques. 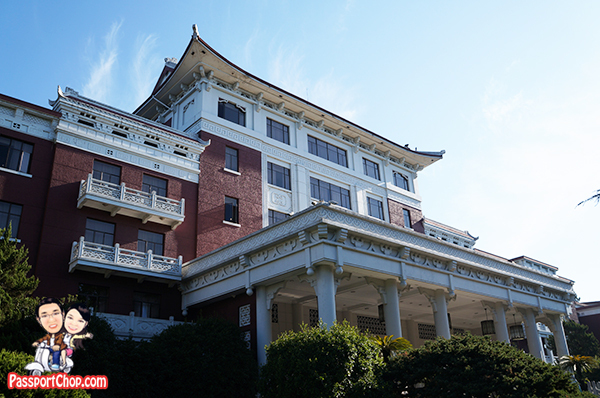 The Shang Palace is located at the West Wing of Shangri-La Hangzhou. The must try dishes at Shang Palace Shangri-La Hangzhou includes the Stirred Fried Crystal Shrimps with Long Jing Tea Leaves 龙井虾仁 (RMB 128) – which is essentially fresh shrimps cooked with Long Jing Tea Leaves; Long Jing Tea Leaves are a Hangzhou specialty and they are a variant of green tea. A long long time ago, a starving and desperate beggar killed a chicken that had roamed out of a farm. He plucked the feathers off the chicken and wrapped it tightly in lotus leaves to take home. His theft was soon discovered by patrolling guards. In a panic, he buried the chicken in the clay mud to cover up his misdoings. After a few hours passed when the search for the thief stopped, the beggar went back to dig up his chicken and to his surprise, the chicken had baked hard under the hot afternoon sun. When the hardened clay was cracked open, the chicken inside was tender, succulent and flavoured with the delicious scent of lotus leaves. And thus, the legendary Beggar’s Chicken dish was created. Another version of the story was that a Qing-dynasty Emperor passed by. Attracted by the aroma of the baked chicken, he stopped and dined with the beggar. The Emperor loved the Beggar’s Chicken so much that it was added to the list of dishes served at the Imperial court. Hence, Beggar’s Chicken is also called “富贵鸡” (literally “rich and noble chicken”) in Beijing. All the stories aside – the Beggar’s chicken is really worth a try – the unique cooking technique produces the most tender, juicy, moist, and aromatic chicken. The original taste of the chicken is perfectly retained and trapped inside the chicken. The lotus leaf lends the signature mouthwatering fragrance to the chicken. We call it Kong Ba Pao in Singapore (see the bottommost picture in the collage below) – they call it Braised Dongpo Pork 东坡肉 in Hangzhou. 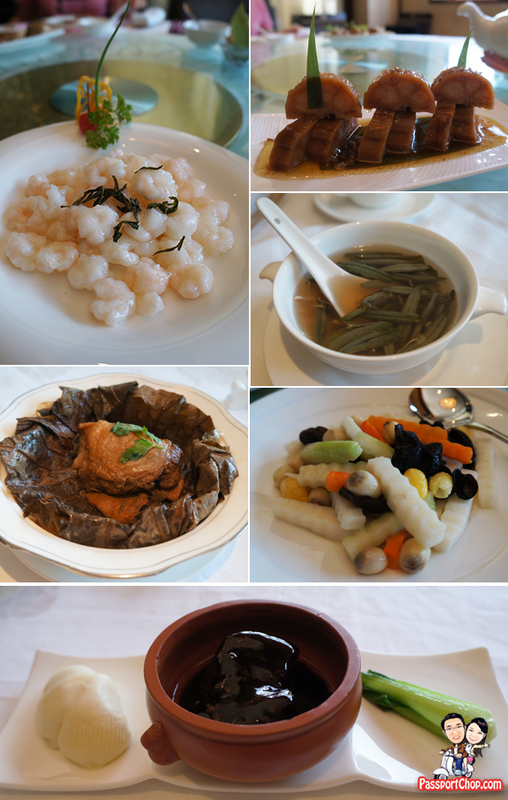 This dish is served in individual portion (RMB 28 per person). This dish can be attributed to Su Dongpo 苏东坡, a scholar and court official during the Song Dynasty (宋朝). He is known for his brilliance in poetry, calligraphy, and writings in Chinese literary history.The story behind the creation of the dish was that one day, he was so engrossed in a game of Chinese chess with an old friend that he forgot all about a pork belly dish he was braising on his stove. He was reminded of it only by the aroma of what has now become an even more tastier version of the dish he had set out to cook – the extended period of braising had made the meat even tender and better – thus the Dongpo Pork dish was created! 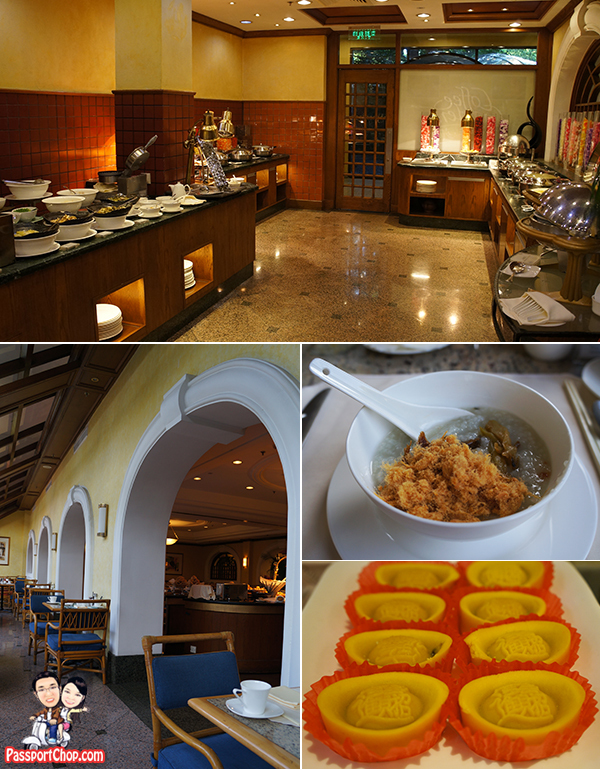 The unique and open buffet at Coffee Garden serves a blend of Asian and international fare throughout the day. With a patio for outdoor dining and a constantly-changing buffet menu, guests can enjoy the ambience and taste the different dishes on offer. This is also where guests will come for their breakfast – the Coffee Garden is in the West Wing so guests staying the East Wing can take a buggy ride over or walk along the sheltered walkway. 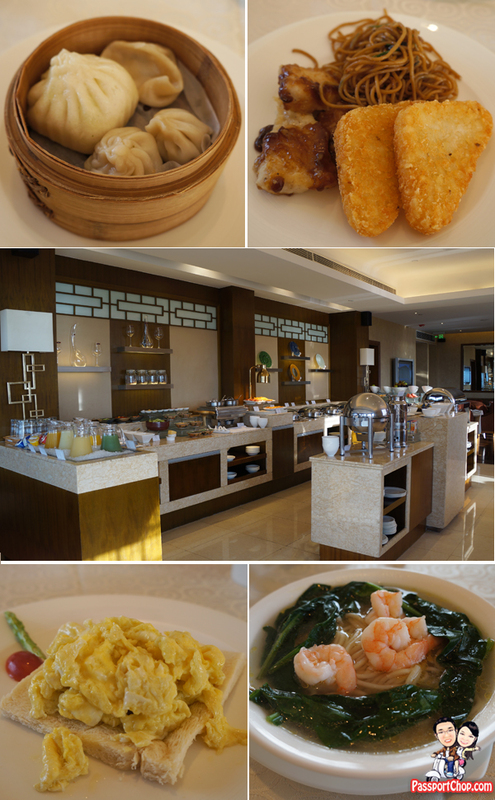 If you are a Horizon Club guests, you can also enjoy your breakfast at The Horizon Club on the East Wing – the selection of breakfast items is good and you can also enjoy a great view of the West Lake from the club lounge balcony. 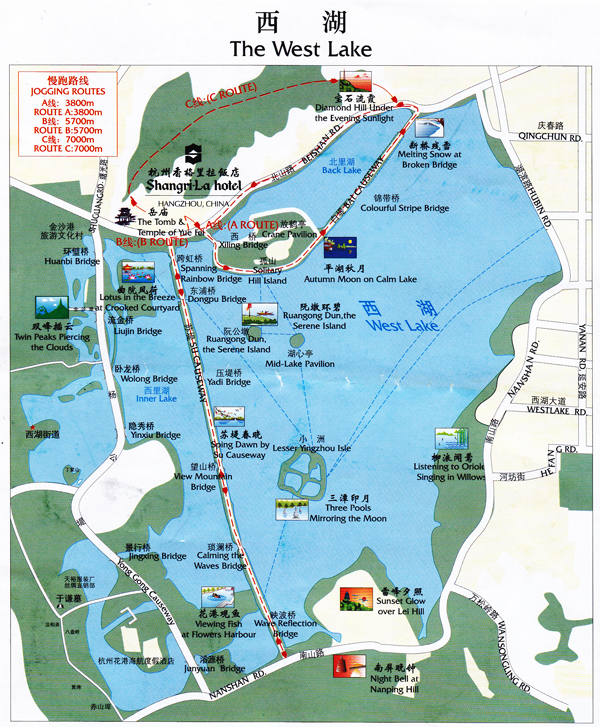 To explore Hangzhou West Lake, you can rent a bicycle from Shangri-La Hangzhou Health Centre (located between the West Wing and East Wing – ask the hotel buggy to bring you there) – also ask the hotel concierge/reception for a map of the West Lake – the Shangri-La Hangzhou map is one of the most comprehensive map of Hangzhou West Lake – detailing where each of the 10 Scenic Spots in West Lake 西湖十景 are. 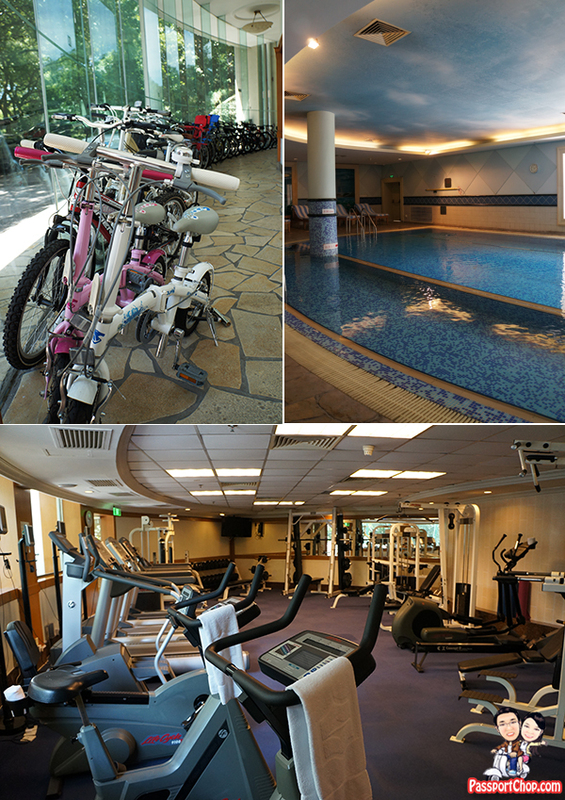 The Hangzhou Shangri-La Health Centre has almost all bicycle variants from children bikes, mountain bikes to tandem bicycles! There are also indoor swimming pool facilities and a well-equipped gymnasium at the Hangzhou Shangri-La Health Centre. Don’t get too excited about the 10 Scenic Spots in West Lake 西湖十景 because while the name of each of these sights sound very scenic and exotic e.g. Remnant Snow on the Bridge in Winter 断桥残雪 where this sight was described as appearing to looked as if half the bridge was swallowed by snow – this view was perhaps possible a few hundred years ago when the winter was very cold and there wasn’t as much tourist and boat activity around the bridge. Instead of trying to mark each of these 10 West Lake scenic spots off a checklist by visiting each of them – just spend a day or two wandering the circumference of the lake and the causeways (either walking or cycling or take a electric tour tram), take a ferry to the islands, and you will probably see most of the sites anyway (though you might not know you have since the sights are not very obvious). 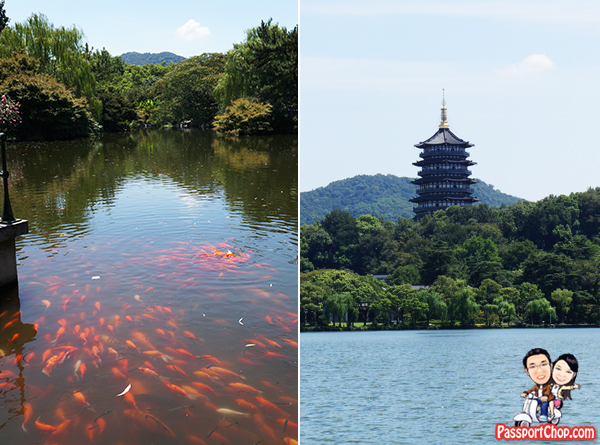 2 of the 10 West Lake Scenic Spots we checked out include 花港观鱼 Fish Viewing at the Flower Pond (see picture on left) – Originally a private garden of an official in Southern Song Dynasty, this area is a typical southern style garden with flowers, pavilions, and waters that flow into the West Lake. Another sight we checked out is 雷峰夕照 Leifeng Pagoda in the Sunset (see picture on right). The Leifeng Pagoda was built in 977 during Northern Song Dynasty to pray for the prosperity for both the country and the people. The Leifeng Pagoda is known for the legend of White Snake, who is said to be locked up below the pagoda. The scene of the afterglow covering the pagoda during sunset makes it look like Buddha light illuminating the West Lake. 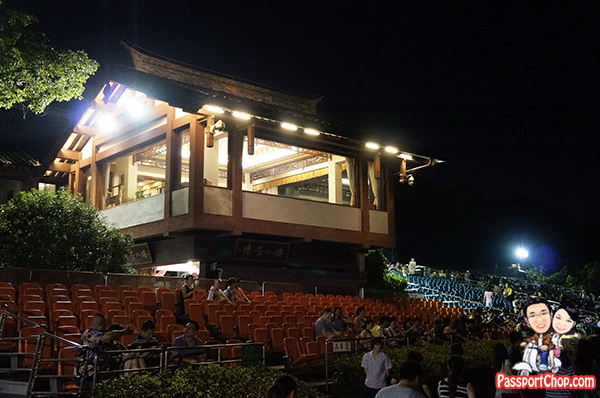 The performance stage is actually on a part of West Lake – yes, on the lake itself – actually a giant stage was built 3 centimetres below the lake surface. 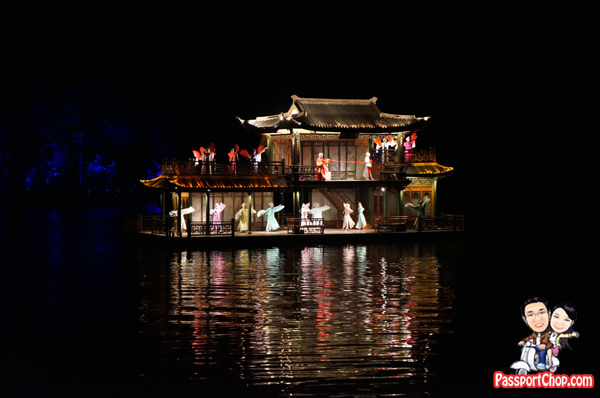 Impression West Lake is a spectacle of light, music, dance and theatrics with a story based on a Hangzhou legend. Using the lake and its surroundings as props, lights and hundreds of actors create a sensational performance. The Impression West Lake portrays the legend of the White Lady Snake and Xu Xian, a love story well known in Chinese history. This tragic Chinese love story is recounted in five episodes: Making Acquaintance, Falling in Love, Parting, Memory and Impression. For those unfamiliar to the story, the whole plot might not make any sense as there is no subtitles (english or chinese) and almost no narrative to describe the scenes but what caught my attention about the performance was the many surprises throughout the whole performances. The surprises being how sound, light and water were combined to create vivid, beautiful and memorable dance sequences and effects. The director of this show is Zhang Yimou, who was in charge of the opening and closing ceremonies of the 2008 Summer Olympics in Beijing. This performance is co-directed by Wang Chaoge and Fan Yue. The music is composed by Kitaro and the song is from Zhang Liangyin. With such a star-studded creative team, it is not a surprise that Impression West Lake is such a huge success. Do note that there are other evening performances throughout Hangzhou but these are nowhere as impressive as Impression West Lake (as they are likely performed on normal stage sets and definitely not directed by Zhang Yimou) but the names of their performance are deceptively similar to Impression West Lake so be very clear that you are buying the right tickets – you can’t go wrong with Shangri-La Hangzhou Impression West Lake package. “Beyond dispute, the finest and noblest in the world,” was how, centuries ago, Marco Polo described Hangzhou. And even after hundreds of years, West Lake Hangzhou is still as impressive and I strongly recommend that you complete the experience with a stay at the Lakeview rooms of Shangri-La Hangzhou and savoring Hangzhou fine cuisine at the Hangzhou Shangri-La Shang Palace.